Few possessions are as highly prized by duck hunters as their favorite calls. Enabling the hunter to attract waterfowl by mimicking their sounds, the skillfully crafted and highly individualized calls are revered for the craftsmanship and rich history associated with this uniquely American art form. In Calling the Wild: The History of Arkansas Duck Calls -- A Legacy of Craftmanship and Rich Hunting Tradition, avid Arkansas duck call collector and author Mike Lewis chronicles the history of Arkansas duck call making and captures the spirit of over fifty renowned call makers with enthralling, evocative historical profiles. 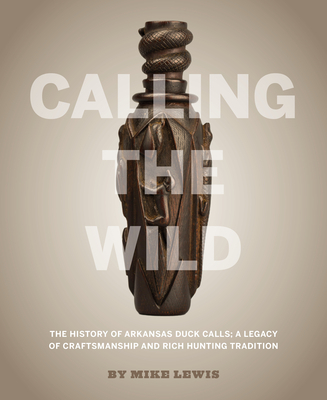 He recounts how Arkansas artisans dominated the early market and continued to influence the design and refinement of the modern duck call through the vivid combination of images and stories. The four-hundred-page book traces the evolution of call design from 1890 to 2017, featuring the work of call makers whose contributions of handcrafted duck calls are highly regarded as among the most prized in the world. Lewis includes over three hundred call makers and over seven hundred photographs that facilitate identification of the calls in this highly collectable legacy publication. This photographic journal is an invaluable reference book and collector's guide, a treasurable accessory to waterfowling, woodworking and folk art enthusiasts and a must for collectors who will assuredly pore over its pages time and time again.